Theme offers variable width for various devices. This new premium WordPress theme for churches is as powerful and robust as it is visually appealing. 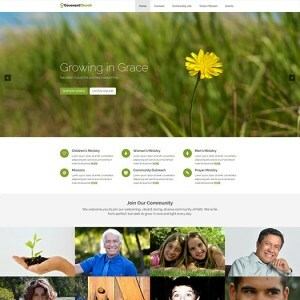 Far from your average, generic template, this is a fully responsive WordPress church theme with a unique homepage jump-scroll feature, as well as included sermon organizer and sermon player functionality, and donations and tithing functionality - with the opportunity to connect those to payment gateways. In other words, this is a complete website solutions for churches looking to make the most of their online presence.